Born in 1966, received her MA and her Ph.D. in Experimental Psychology at the Keio University, Japan. 1995-1997 Research fellow of the Japan Society for the Promotion of Science; 1996-1998 instructor at the Senzoko Gaknen Junior College; 2000 Research Fellow Canon Europa Foundation; 2001 instructor at the International University of Health and Welfare; 2002-2003 instructor at the Chiba Institute of Technology; 1997-2003 Research assistant of Chiba University, from 2003 Associate Professor of this university. 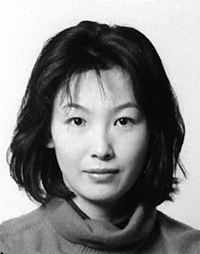 In 1999 Yoshie Kiritani received the Wolfgang Metzger Award 1999 for her work with Giovanni Bruno VICARIO on "Slow-motion tunnel effect: an inquiry into vertical organization of perceptual events" (published in Gestalt Theory 21 (2/1999), 100-121. The effects of relative size of inducers and of viewing distance on perception of anomalous surface, Japanese Psychological Research, 36(3), 178-181. Perceptual causality in amodal completion of kinetic structures. Psychological Research, 62, 255-260, (1999). Amodal perception of kinetic structures as perceptual causality. In M. Zanforlin & L. Tommasi (Eds.) Research in perception. pp.233-235. Padova: Logos Edizioni, (1999). Effects of shape and noise on speed perception - its implications for road design. 2003 European Conference of Visual Perception (Paris, France). Effects of the figurativeness of visual images on comprehensibility and interestingness of the advertisment. Journal of the Asian Design International Conference, 2003. Slow-motion tunnel effect: an inquiry into vertical organization of perceptual events (with Giovanni Bruno Vicario). Gestalt Theory 21 (2/1999), 100-121.